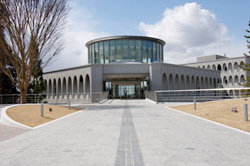 In 1986, the School of Sociology was founded as the fifth school of Chukyo University, and reorganized into the School of Contemporary Sociology. The School enhanced its system to realize practical and academic approaches to the problems of contemporary society with these objects: organizing a research system to integrate sciences related to social life, and educating students to seek solutions to conflicting problems out of modern society without being disoriented in the abyss of social changes. Original principle is observed; a flexible structure with no boundaries between departments within the School, putting an emphasis on field working and research, and fostering sensitivity, creativity and the ability to take action. The curriculum for the School of Contemporary Sociology is formed taking three study methods to enhance students' ability to tackle diverse social problems. In order to create an environment where teachers are able to watch over the students in small classes, the courses for the second year and the after are centered on field practical training. All teachers offer practical training courses in their specialized fields, from which students are able to select those that most interest them. In the first year in this School, students take Communication Skill I (to acquire basic skills required for study of the School), Communication Skill II (to acquire computer operational skills), Fundamental Contemporary Sociology, Introductory Sociology, and Introduction to Social Research, to acquire the disciplinary basics. Diverse themes in Contemporary Sociology are categorized into six research areas. Students begin with general study of the six areas, and then concentrate the study to their own specialized fields. Media Expression: Study about mass communication and media, and taking practical training in producing methods. Globalization and Culture: Study on cultural diversity from historical point of view to encounter the world as a whole. Care and Support of Mind: Facing one's own mind within the context of vast society. Coexistence and Welfare: Seek methods of building a future in which all members of the society can live in the way they desire. Environment and Town Development: Formulate concepts for town development for a new era from the perspective of the environment and community. Education, Family and Life Course: Examine the process of growth in the family, school, and community.